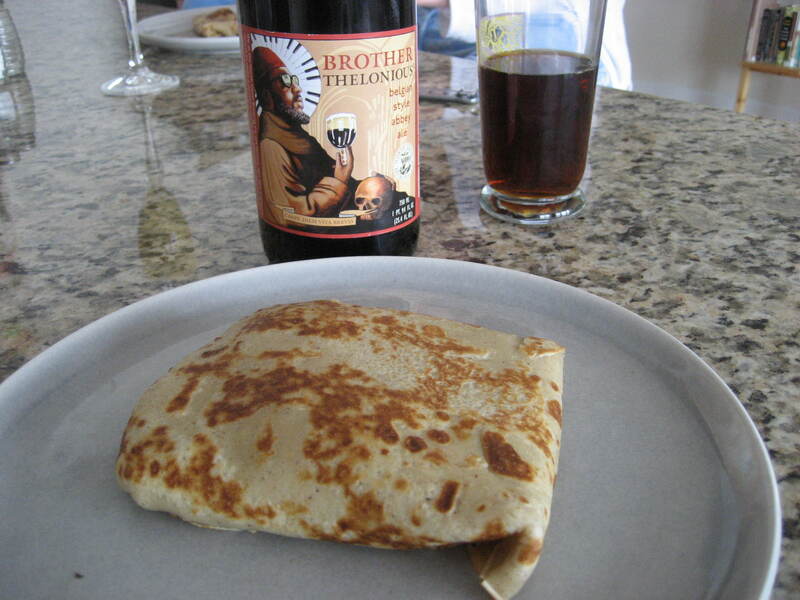 i’ll never forget my first crepe encounter. with no fear of the notorious attitude and only a few short days to spend roaming around paris, i was quickly enticed by the smells coming from one of the many food carts dotting the street corners. that monster crepe set me back a mere €3, was stuffed with ham, cheese and mushrooms, and was handed to me wrapped in foil, burrito-style. it was bliss. i continued to eagerly seek out crepes when i returned to the states, trying many restaurants in both philadelphia and miami beach before i finally decided to try my hand at them at home. i’m embarrassed that it took me so long! especially considering how simple they are to make. the original recipe I started using was sans sugar, cinnamon and vanilla but i find that a touch of sweetness adds a lot. i usually follow this recipe when i’m cooking for just the two of us (it’s one of my husband’s favorites, so though it makes a lot, he takes care of it) and i double or triple the recipe if we have guests or are hosting brunch. in a large mixing bowl, whisk together flour, eggs, milk & water. add salt, butter, sugar, cinnamon & vanilla. beat until smooth. heat a lightly oiled 10-inch frying pan over medium high heat. 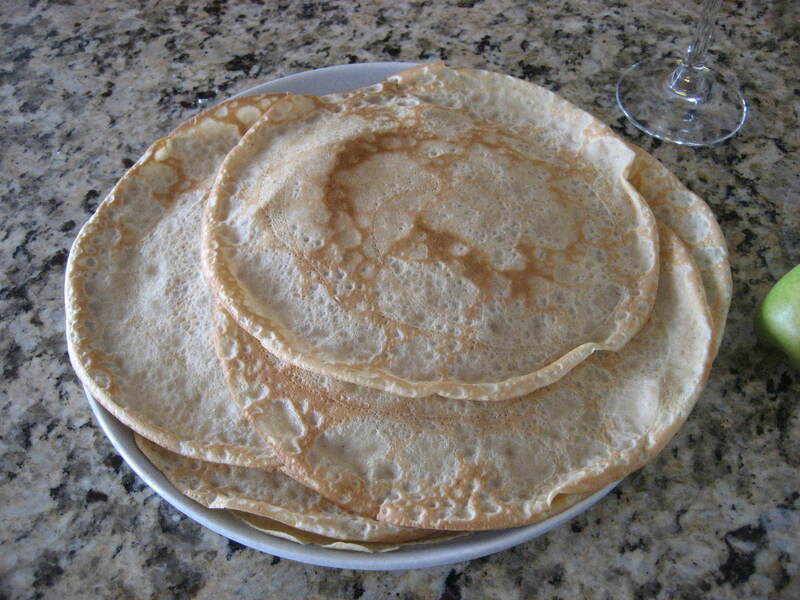 pour 1/4 cup of crepe batter into the pan, and roll it around to coat the bottom of the pan. wait a minute or so, until the crepe starts to bubble up a bit and the edges come up easily, and flip for about 10 – 30 seconds before removing to a plate. i find, for some reason, the first two to three are not my best work. not sure if it’s me, the heat of the pan, or what. but just saying. this past weekend, my friend and former roomie susannah was visiting, and i opted for a decadent, option-filled spread. in addition to the obligatory mimosas, we had sauteed mushrooms, cheddar, brie, goat cheese, pears, strawberries, blueberries, honey and nutella. we started out savory and ended sweet. the combinations were endless! gaspar went for cheddar, sauteed mushrooms and some leftover pulled beef from his crockpot experiments, while sus and i opted for sauteed mushrooms and brie. 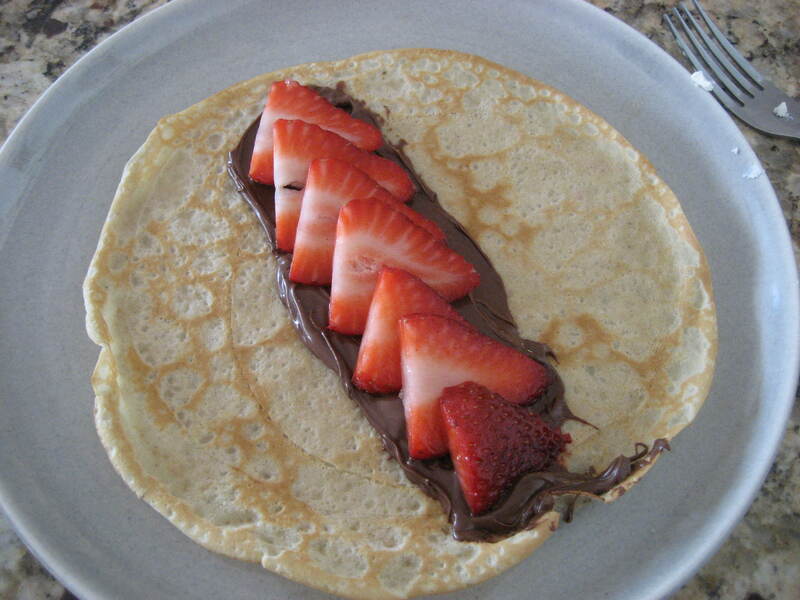 goat cheese and pear, nutella and strawberries…i could do this all day.